Maybe it’s an illusion. We have shaped the piece, obviously, and we continue to do so (having a dramaturg embedded in the process has been invaluable), but in a way it feels like the piece has taken shape without our complete or conscious understanding. We’ve proceeded intuitively. We’ve made something, and now we’re trying to figure out how we might improve upon it. And I, for one, am wondering about what it is that we have made, and what it might mean. I’m reminded of one of Goat Island Performance Company’s maxims: we have discovered a performance by making it. Effect, cause. Creation, retrospective understanding. So what is this thing we have (un)knowingly made? I notice that we tend to call it a ‘piece’, not a ‘play’. It’s certainly not a ‘well-made play’ in the nineteenth-century sense of the term. There’s no plot or narrative as such. It isn’t linear. There’s dramatic tension, but it’s not shaped in a conventional fashion (escalation, conflict, resolution or schism). There’s a scenario. There are characters, but they’re not stable characters. There are various modes of presentation. 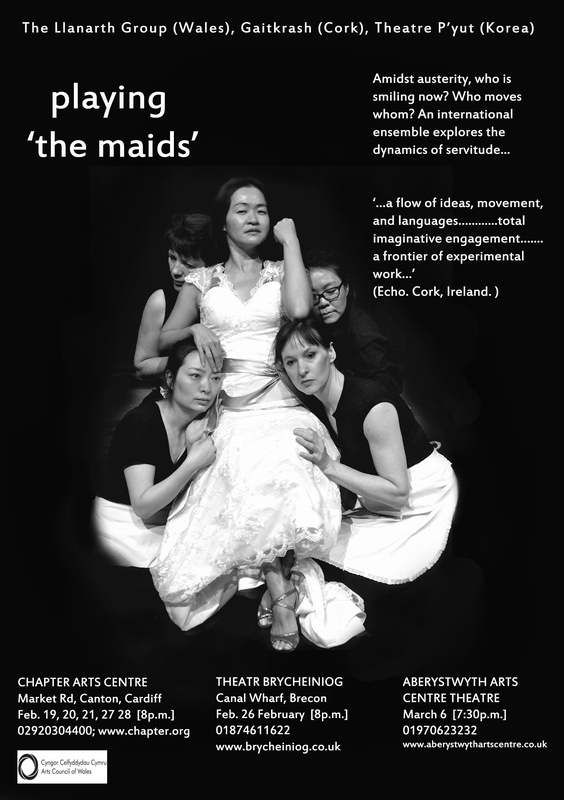 Genet’s The Maids plays with a variety of scenarios, rehearsing action, and moves towards a violent conclusion. 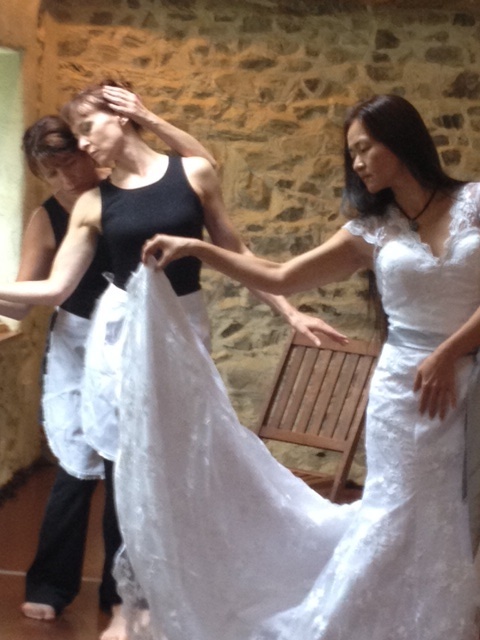 playing ‘the maids’ inhabits stasis for a lot of the time, like symbolist theatre (silence, stillness, waiting, inaction, gestures, whispers, listening, apprehending), though it resembles expressionist theatre too (phantasms, ciphers, chiaroscuro, unconscious desires, ecstatic self-abandonment). Things are perpetually put into potential, or actual, flux. It does not move toward violence but instead moves in on itself, both literally and figuratively. The (in)action is not resolved (shades of absurdism? ); rather, it’s deepened, and what appears to be an intractable status quo, a permanently settled hierarchy, is revealed as a much less orderly state of affairs–mutual entanglement and complicity. Genet’s play rehearses and performs role reversal. One of the maids might ‘become’ Madame, taking her place, but that will not alter the system of power. The final scene of playing ‘the maids’ presents a more complex, and altogether more disturbing, arrangement of subjects. It replaces structure with anti-structure (choreomania?) and suggests that personal agency is a whirligig, a canard. Yeats’ articulation of situational chaos and barbarity is almost a hundred years old. Thinking about it in relation to the final scene of playing ‘the maids’, which one might read as a oblique commentary on capital in the twenty-first century, are we still “turning and turning in the widening gyre”? The end of August 2013 has been marked by a week of making, playing, devising, scripting, montaging, collaborating and sharing work in progress with two audiences of [Playing] The Maids, a collaboration between three companies and nine artists from four countries: South Korea (Theatre P’Yut), Ireland (Gaitkrash), Wales (The Llanarth Group) and Singapore. 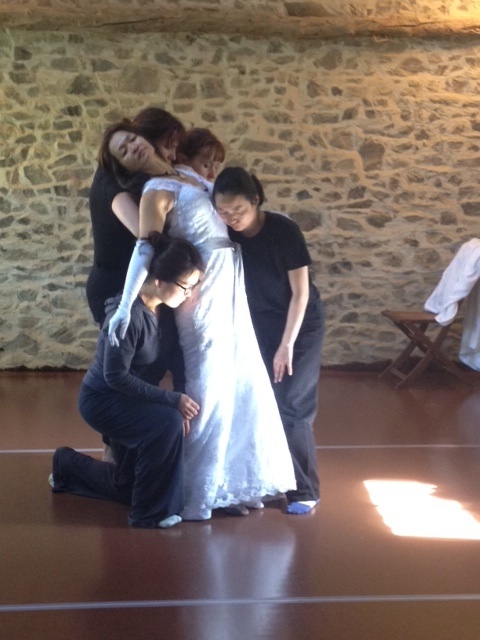 Each collaborator brought ‘entry points’ to devising, informed by their interpretation of themes from Genet’s The Maids. This may have been a piece of music from cellist Adrian Curtin, or a sound environment created by Mick O’Shea and Adrian for the performers to respond to and dialogue with; sometimes it was found or created text, images, choreography or traditional dance from the individual’s cultural background. The points of entry into collaboration were each explored and shared, and by mid-week we had a list of thirty possible structures (‘scenes’ or components) we could develop further. 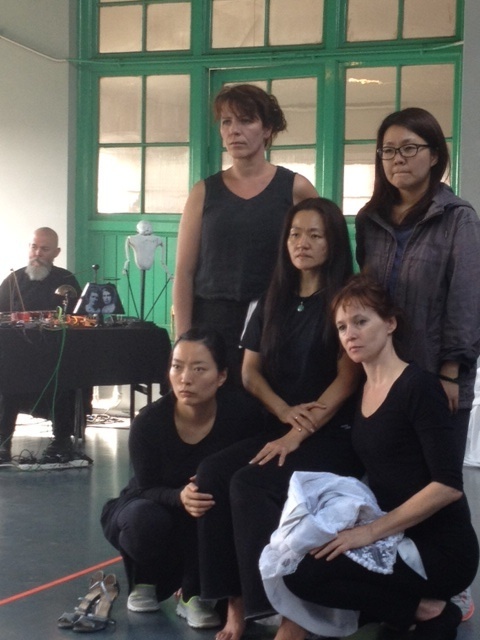 At a dramaturgy meeting mid-week Sunhee Kim, Phillip Zarrilli, Bernie Cronin, Regina Crowley and I sat down and worked through the list Phillip and I had compiled, as outside eyes, of the list of raw materials. We identified different compartments including Text, Structured Improvisations, Physical scores/ choreography and ‘mixed’. We then revised each structure, prioritising some for further development that week, and shelving others for future development in a later part of the project. Already some elements were coming together as possible sequences, which we scheduled for montage and further exploration the next two days. 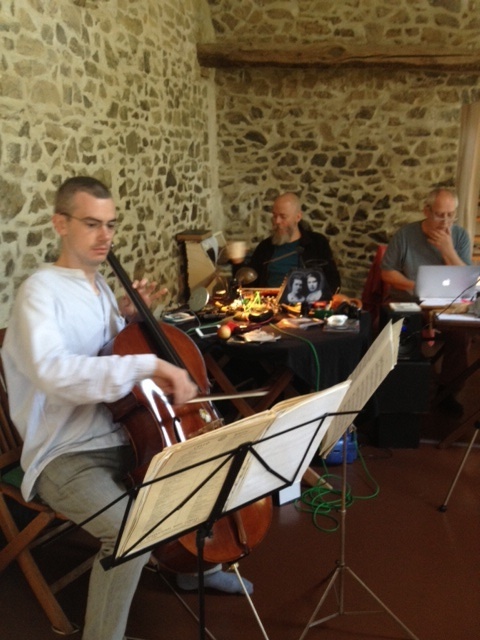 By Saturday, our sixth day together, we had approximately 80 minutes worth of material, some scripted and choreographed, others improvised, which we shared with a small invited audience in the Llanarth Group’s studio in west Wales. It was an informal presentation to artists and those predominantly working in performance, talking through part of the process and putting very raw work up before an audience for the first time. This part of the procedure was immensely fruitful, but not one I would recommend for inexperienced practitioners or a ‘general’ audience. The work can be very delicate so early on in development, and it takes robust, experienced practitioners and knowledgeable, supportive audience members to ensure the work isn’t bruised by such early exposure. Our experience was extremely helpful and informative, and we instantly learnt lessons about the work, the montage, and areas for further revision and development. Sunday morning we drove in convey to Cardiff and our second informal sharing at Y llofft, Chapter Arts Centre. Informed by the sharing the day before, we revised the structures, trying out new formations and dynamics in a new space. As the larger invited audience arrived, we showed three sequences, in some cases trying out new things for the first time, which was an exhilarating experience for the company as well as the audience. We received extremely positive feedback from the audience afterwards, who were also predominantly made up of those involved in live performance – performers, practitioners and educators. It was an affirming and triumphant end to an extraordinary week, and the company members dispersed to the train station, the night ferry, and Heathrow airport affirmed and extremely excited about the next phase of the development, scheduled for 2014. Diary of a collaboration. Day 5. 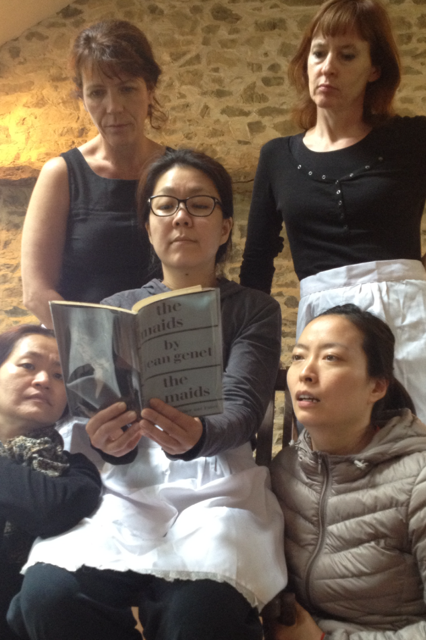 Jing, Bernie, Sunhee, Regina, Jeungsook and Genet’s ‘The Maids’ (first edition). 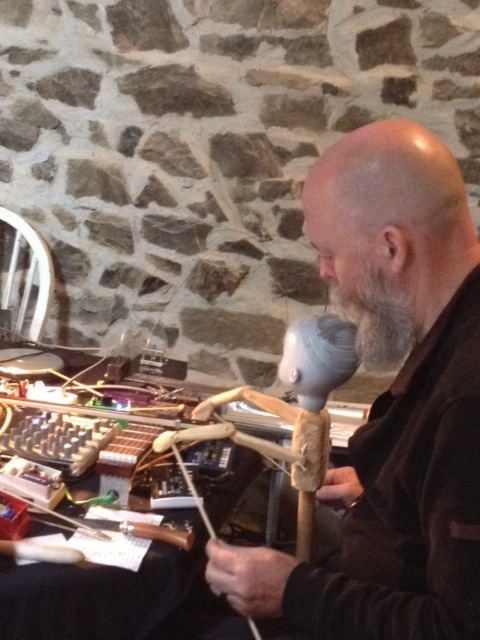 Mick O’Shea and puppet at the sound desk. Regina Crowley, Bernie Cronin and Jing Okorn-Kuo. A day of running structures, testing, revising, trying, assembling….